iam going to launch my new brand of cricket bats. i want somebody to design sticker. the name is " black scorpion " . i want scorpion image on the back of bat like slazenger bats. the sticker should metallic shinny. winner will get my brand bat for 50% off price. my brand bats are double layered blade bats. yeah u heard right double layered blade , they are awesome. so now get to work and send me sticker design. above is general bat template for ur design. ( it is not the one iam going to launch , its just template to work on ). You cannot sell a double layered cricket bat, it will not be allowed to be used in cricket by the MCC. Bat design pic is good though, did you make it? jawad 1985, do you make these bats yourself? 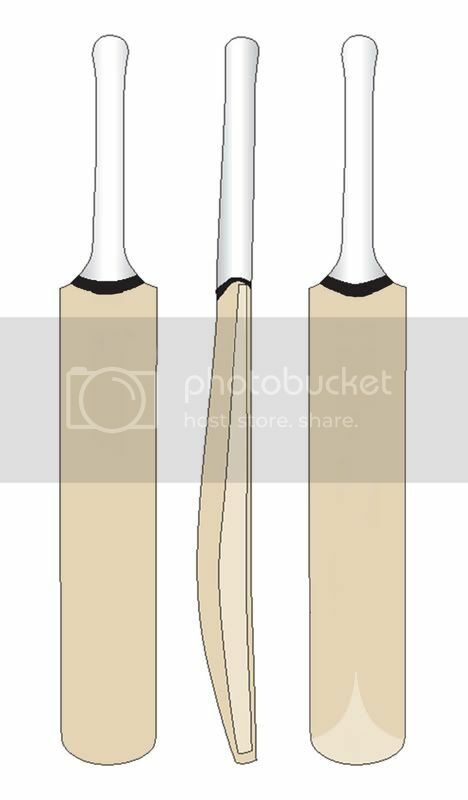 how wud a double layed bat work? good luck jawad, i get the feeling you'll be staring down the barrel of a gun with your 'double layered' bats selling point - but good luck! How do you know they're awesome? If I were to buy one I'd buy one from a company who actually makes them for players. There's a few ways you can laminate to get better performance and I'd rather buy from a company who can do it well than someone who is importing them. Very easy to do, very hard to perfect. after reading some of the post about the the bat, iam going to launch that it is illigal. will somebody please send me the reference number of law about the bat. i will put some pics next time on forum for you guys. about the making of these bats , no i dont make these bats by myself but i have batmaker who do it. Law 6 is the one to read. i check law 6 , it didnt say anything about laminated bats. The bat overall shall not be more than 38 inches/96.5cm in length. The blade of the bat shall be made solely of wood and shall not exceed 4 1/4 in/10.8cm at the widest part. The blade may be covered with material for protection, strengthening or repair. Such material shall not exceed 1/16 in/1.56mm in thickness, and shall not be likely to cause unacceptable damage to the ball. (a) reference to the bat shall imply that the bat is held by the batsman. shall be regarded as the ball striking or touching the bat, or being struck by the bat. one of mate ask " how do i know they are awesome ? " , i used them in 4 premier league matches and in couple of sidematches. after middeling the ball , the ball fly like rocket. As i used them in premier league matchs too , nobody say the bat is illigal. our premier league runs on ICC rules. Page created in 0.545 seconds with 36 queries.